Happy Holiday weekend. It is time for this week's Sweet Treats. 1. Make These sweet little Rose Cookies. Over at I am Baker there is a entire tutorial. Bake them up and put them in a box. A perfect do-it-yourself wedding favor. 2. The Crafting Chicks have some lovely crafting ideas like these pink bottles wrapped in paper eyelet. 3. Mi Belle Photography sure does take a pretty picture. Especially these pink Louboutin shoes. 4. Oh So Beautiful Paper had these extra cute Save The Dates. 5. 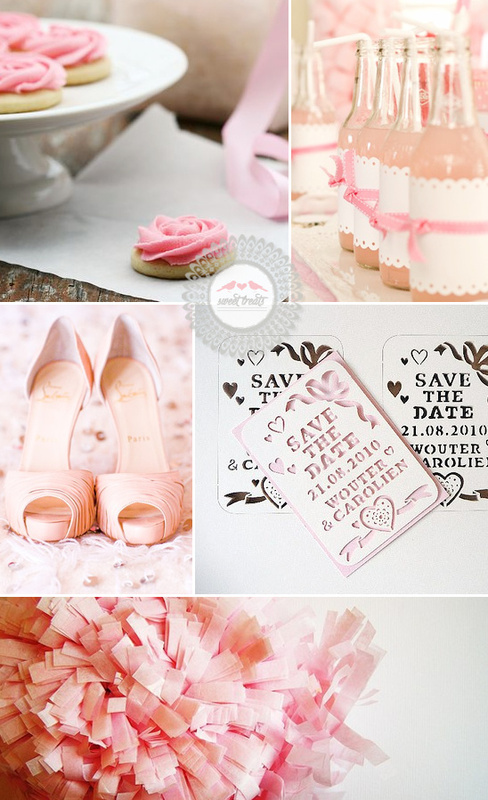 Pastel Pink Garland for all your wedding decor needs.